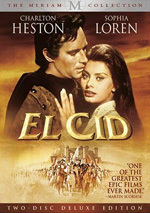 The success of Mann's wide-screen epic El Cid (1961) led to this even grander undertaking, one of Hollywood's periodic infatuations with the decadence of Imperial Rome. After murdering his father, Emperor Marcus Aurelius Commodus drifts into a life of wanton depravity as the Gothic hordes gather at the Empire's borders. A Hollywood spectacular in the grand tradition, but Mann manages to elicit some terrific performances amongst the mob scenes. According to the trailer, the film contains "Not just 3 or 4, but ALL of the known emotions!" Can one feel nostalgia for a period through which they didn’t live? If so, I admit I look back with some longing at the era during which movies were big. Oh, those of us born in the late 1960s and subsequent periods got our big blockbusters, and I do recall times where flicks became real events, but I missed the super-sized epics of the 1960s and earlier. There’s a power they boasted that newer large-scale efforts lack due to the realness they featured. No CG meant actual extras and sets, not digital versions. Granted, just because these old flicks had more humanity to them doesn’t mean they were necessarily better. In fact, quite a few were bloated messes. Nonetheless, there’s always something at least moderately fascinating about them due to their scope, and I like to check out new (to me) epics when I can. On today’s schedule: 1964’s The Fall of the Roman Empire. Set in 180 AD, Emperor Marcus Aurelius (Alec Guinness) rules the Roman Empire, though not for long, as he nears death. He chooses favorite warrior Livius (Stephen Boyd) as his heir because his son Commodus (Christopher Plummer) prefers fun and games to the ways of the ruler. Commodus learns this when he visits the scene of an upcoming battle between the Romans and the barbarians, and the news doesn’t sit well with him. Though he and Livius are long-time friends, the Emperor's decision causes a rift between them. To shore up Rome’s eastern frontier, Marcus Aurelius betroths his daughter Lucilla (Sophia Loren) to Sohamus (Omar Sharif), the king of Armenia. Neither seems too happy about this prospect of marriage without love, but political realities demand it. The decision doesn’t sit too well with Livius either, since he wants Lucilla for himself. In the meantime, political intrigue occurs behind the scenes. Some of the Emperor’s advisors know of his plan to disinherit Commodus and install Livius on the throne, and they want to prevent that. Blind court prophet Cleander (Mel Ferrer) agrees to provide Marcus Aurelius with poisoned fruit so he’ll die before he can name Livius as his successor. This coup succeeds, though Livius doesn’t contest the right of Commodus to the throne since he can’t prove the Emperor’s preference. Commodus takes over as the leader of the Roman Empire and names Livius second in command out of gratitude for the latter’s fence-mending ways. We watch how Commodus runs the Empire and how both Livius and Lucilla react to related issues. If the story of Fall sounds familiar, that probably means you saw 2000’s Gladiator. That Oscar-winner clearly borrowed heavily from this flick’s storyline. Ridley Scott’s movie wasn’t a carbon copy of Fall, but it definitely showed a slew of similarities. Though I never counted myself as a fan of Gladiator, I think it provides a more satisfying experience than the sometimes slow and leaden Fall. The 1964 flick takes forever to get going, as we’re more than 45 minutes into the story before any action occurs. I wouldn’t mind the leisurely pace if the film built up its characters in a more substantial way, but it leaves them fairly thin and undeveloped. I suppose my preference for Gladiator over Fall seems somewhat ironic since the 2000 flick is exactly the one that sprang to mine when I bemoaned the current reliance on computer effects in epics. Indeed, I must praise the lavish detail and sense of realism in Fall. At all times, it looks terrific, with lavish production values that remain remarkable. Fall does improve somewhat as it progresses, I’ll admit. The flick plods at its start but shows sporadic signs of life. I’m not sure it was wise to include a chariot race, especially since the presence of Boyd behind the reins makes comparisons to Ben-Hur all the more inevitable. This flick’s race doesn’t live up to that in its predecessor, but it excites nonetheless and turns into one of the film’s standout moments. Actually, when we don’t see Boyd, the movie tends to work better. James Mason does quite a lot with his role as Livius’ assistant Timonides. He becomes the film’s voice of reason and he adds both heart and weight to the proceedings. The sequence in which he endures torture really excels, as it shows a quiet sense of pain and devotion that make it memorable. Plummer also does quite well as the flawed Commodus. He displays great charisma in the part and he makes the man surprisingly three-dimensional given the nature of the role. To some degree, Commodus exists to be a mustache-twirling baddie, but Plummer ensures that he’s much more than that. When he appears, the screen lights up, and Fall shows its potential greatness. Unfortunately, we then bump into Boyd and the house of cards collapses. If you examine the DVD’s extras, you’ll hear about a number of actors who turned down the role of Livius, a roster that included Charlton Heston and Kirk Douglas. If either man had played Livius, I’m sure I’d like Fall much more than I do. I don’t think Heston was a great actor, but he possessed a charisma and presence absolutely lacking in Boyd. And Boyd’s inherent dullness practically ruins Fall. He’s essentially a male mannequin, as he displays absolutely no spirit or personality as Livius. Whenever he shows up onscreen, the film quickly loses any form of spark it might have boasted. Boyd creates a flat, bland character. If we can’t find any reason to care about him, how are we to believe he could inspire so many citizens and soldiers? Short answer: we can’t, and that’s a shame. Surely the producers could’ve found someone more vivid and less anonymous than Boyd. Actually, I think Plummer would’ve made a good Livius, and Mason could’ve played Commodus, though I suppose his age might’ve become a factor. That would’ve given us a much more satisfying movie. As it stands, Fall occasionally satisfies, but it seems too inconsistent to be a great film. I like certain parts of it and think that a few of the actors help give it life. Unfortunately, its lead does grave damage to the production, and some slow pacing in the first act also makes the movie tough going. This is a generally interesting but erratic flick. 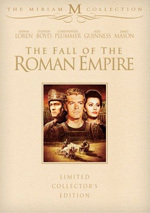 The Fall of the Roman Empire appears in an aspect ratio of approximately 2.35:1 on these single-sided, double-layered DVDs; the image has been enhanced for 16X9 televisions. Though the flick held up well after 44 years, it showed a few minor issues that took it down to “B” level. Sharpness suffered from mild variations. In a reverse of the usual pattern, wide shots usually looked the best, as the film’s many broad images rarely displayed any softness. However, close-ups could be a little iffy at times, as some of those seemed a bit tentative. Overall, though, the flick demonstrated nice clarity and definition. I noticed no issues with moiré effects or shimmering, and edge enhancement was absent. Source flaws stayed modest as well. I witnessed a few small blotches and specks, but the vast majority of the film appeared clean. Colors varied and could be a little disappointing. I thought the hues tended to appear a bit pale during some parts of the film. They displayed better vivacity when the flick got to Rome in the second half, and they never seemed weak, but I felt they could be a little more restrained than they should be. Blacks seemed deep and dense, while shadows were clear and smooth. All of this made for a good but not great transfer. In addition, I thought the Dolby Digital 5.1 soundtrack of Fall seemed quite good, especially for a 44-year-old movie. Granted, the soundfield stayed moderately restricted, but it opened up matters in a satisfying manner. In the front, the action spread well across the channels and meshed together smoothly. The various elements demonstrated accurate placement and fit together well. Music also boasted strong stereo imaging. As for the surrounds, they played a small role in the proceedings. They usually bolstered some of the material in the front in a modest manner, though they occasionally showed decent liveliness. For example, a battle scene boasted the clanging of swords from the rear speakers, and thunder also roared in the rear at times. None of this meant a whole lot, but it added some scope to the package. Given the age of the material, audio quality seemed positive. Speech was a little reedy at times, but the lines were always intelligible and usually appeared pretty natural. Music could’ve packed a little more punch, but the score showed acceptable range and clarity. Effects were clean and accurate enough to make them good representations of the information. This wasn’t a dazzling soundtrack, but it did well for itself, especially when I considered its vintage. For this “Limited Collector’s Edition” of Fall, we get a bunch of extras. Across DVDs One and Two, we find an audio commentary with producer’s son Bill Bronston and historian/biographer Mel Martin. Both sit together for this running, screen-specific chat. They tell us about cut scenes, producer Samuel Bronston, shooting in Spain, story, interpretation and political context, set design and related production elements, cast and crew, stunts and fight scenes, and a few other issues. If you listened to the commentary for El Cid, you’ll know what to expect here, especially from Bronston. He mostly focuses on the scope and realism of the project; he constantly tells us how everything was real and staged at a huge scale. He seems awfully promotional and he doesn’t add a lot to our knowledge of the flick. At least Martin helps take up some of the slack. He also gets onto the “it’s really real!” bandwagon, but he makes sure we actually learn something about the production and its participants. At no point does this commentary become great, but Martin helps give us some good details about the movie. Four other components show up on DVD One. A 1964 promotional film called Rome In Madrid lasts 22 minutes, 18 seconds. Narrated by James Mason, it follows various aspects of the production and features shots from various sets and locations along the way. We don’t learn a ton about Fall here, mostly because “Rome” exists as a fluffy promotional piece. Nonetheless, I really like all the glimpses of the production; we get to check out wardrobe tests and plenty of cool behind the scenes elements in this enjoyable program. Inside the Trailer Gallery, we locate the theatrical promo for Fall as well as ads for Control, Cinema Paradiso and El Cid. Filmographies arrive for producer Samuel Bronston, director Anthony Mann, composer Dimitri Tiomkin, writers Ben Barzman and Basilio Franchina, and actors Stephen Boyd, Sophia Loren, Alec Guinness, James Mason, Chrisopher Plummer, Omar Sharif, Anthony Quayle, Mel Ferrer, and John Ireland. DVD One finishes with some Still Galleries. This area breaks down into two subdomains: “Behind the Scenes” (50 shots) and “Promotional Materials” (25). Both offer good images, though the “Promotional Materials” are the more fascinating of the two. Over on DVD Two, we discover four featurettes. 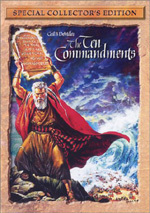 The Rise and Fall of an Epic Production: The Making of the Film goes for 29 minutes, 13 seconds and involves Martin, Bill Bronston, Samuel Bronston biographer Paul G. Nagle, screenwriter’s wife Norma Barzman, historian/Bronston biographer Neal M. Rosendorf, director’s wife Anna Mann and daughter Nina Mann, and production manager CO “Doc” Erickson. We learn about the genesis of the flick, casting and performances, the flick’s scope and production values, sets, locations, problems during the shoot, story, script and research, financial issues, edits, music, and the film’s reception. As with the commentary, parts of “Making” concentrate on the bigness of the production. Those remain tedious, but we get enough quality information to make up for those flaws. I especially like the discussion about the financial concerns and their impact. This becomes a somewhat dry but fairly informative piece. For the 10-minute and 59-second The Rise and Fall of an Empire: An Historical Look at the Real Roman Empire, we get notes from King’s College London Professor of Medieval History Dr. Peter Heather and UCLA Professor of Roman History Dr. Ronald Mellor. They give us a quick take on some issues related to the Roman Empire and its collapse. Obviously a short program can’t do much to cover such a vast subject, but “Look” throws out a good recap of a few prominent topics. Hollywood Vs. History: An Historical Analysis runs nine minutes, 48 seconds and features Rosendorf, Heather, Mellor, Barzman, and Martin. They look at the parts of Fall that accurately represent the reality of the situations and characters as well as which elements take liberties. We get a nice look at fact versus fiction in this short piece. A look at the composer comes via Dimitri Tiomkin: Scoring the Roman Empire. This 20-minute and three-second piece offers remarks from Martin, film music historian Jon Burlingame, composer’s widow Olivia Tiomkin-Douglas, and conductor John Mauceri. They tell us about composer Tiomkin’s participation in Fall and specifics of his music for the film. The participants cover these subjects in a concise and informative manner that allows “Scoring” to succeed. A brief text note comes under the banner of About This Film. 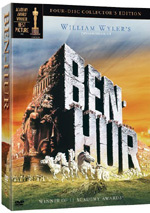 The screen informs us that the DVD represents the original Roadshow cut of Fall and is the “longest version of the film for which the complete set of film elements exists.” It also relates that a scene cut from the Roadshow was found but not in time to make it onto this DVD; the producers may include it in a later "Miriam Collection” package. With that we head to the extras on DVD Three. It features Encyclopedia Brittanica: Educational Shorts About the Roman Empire. We find five of these: “New Introduction” (3:30), “Original Introduction” (2:33), “Life In Ancient Rome” (13:00), “Julius Caesar: The Rise of the Roman Empire” (21:41) and “Claudius: Boy of Ancient Rome” (16:09). In the “New Introduction”, we hear from Encyclopedia Brittanica Films producer/director Bill Deneen as he gives us some background about the genesis of these reels. From there we check out the original 1960s educational shorts created on the sets used for Fall. These offer rudimentary details about the various Rome-related subjects listed in their titles. Though they boast the use of those wonderful Fall sets, the shorts tend to be awkwardly acted and somewhat dry in nature. Nonetheless, they educate fairly well, and they’re fun to see for their archival value. Some paper materials flesh out this deluxe set. A 32-page booklet reproduces the movie’s original program. It provides some notes about the flick, a plot synopsis, credits, and plenty of photos to become a nice memento. Finally, six production stills finish off the classy package. The Fall of the Roman Empire offers a fitfully successful film. It boasts stellar production values, a few excellent performances, and some intriguing story threads, but the pacing lags at times, and a weak turn by its lead actor harms it in a substantial manner. The movie usually works, but it’s less consistent than I’d like. The DVD gives us pretty positive picture and audio as well as a nice roster of extras. Nothing here excels, but there’s enough quality on display to merit a guarded recommendation. Note that two versions of The Fall of the Roman Empire appear on the market. Fans can pursue either this “Limited Collector’s Edition” or a two-DVD release. DVDs One and Two of this set are identical in both, but only the LCE includes DVD Three’s “Encyclopedia Brittanica” clips along with the program and the photo cards. For that, the LCE retails for $39.92, while the two-DVD set on its own goes for $24.95. I like this LCE, but the standard two-DVD version is the better bargain. Though I think the third disc and the other bits are nice, I don’t know if they’re worth so much more money.